Electric Bicycles, E-Bike kits, e-trikes, stand-up electric scooters, and more!. Still waiting for news on availability and parts.. 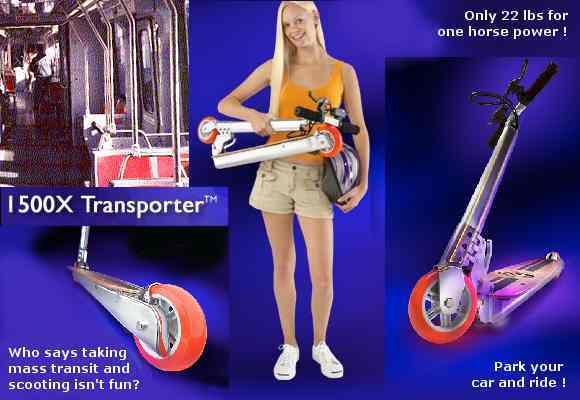 PLEASE BE AWARE...though we sold these portable scooters earlier this year, they have not been available to us since July. We had been expecting availability to resume in August, including a second model...but are still waiting! In the mean time we've had people contact us requesting parts and repairs (including warranty related), for scooters they've purchased on the Internet and from large retail chains. We've told everyone we're at a loss to give advise or even support our own customers. As far as we know the distributor has not made parts or warranty reimbursement available to either us or other independent LEV dealers. Though we're listed as a dealer, we've not been informed of product availability or spare parts, so cannot offer customer support. We thought it a bit unusual for dealers like us to be informed product was not available, then learn otherwise from large retail store customers requesting parts and/or repairs. As of October '04, The 1500SX have indeed been available for sale at certain outlets, at significantly discounted prices...though questionable product support according to the numerous calls from those seeking repairs or parts. We're hoping there'll still be a happy ending to this story...but until we know more, suggest prospective buyers learn if there is a parts/repair department before purchasing!